Moving time: 4 hr 46 min. Wind: Variables breezes. About 15 miles of 10 mph tailwinds. Weather: 60°F (16°C) in the morning; got up to 85°F (29°C) by end of ride at 4:00pm. Mostly sunny. A beautiful day in Idaho. 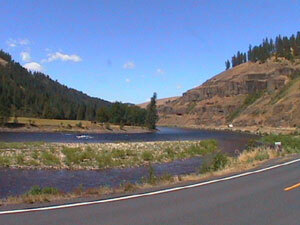 The route picks up the middle fork of the Clearwater River in Lowell and rides along it until Kooskia where it joins its south fork. 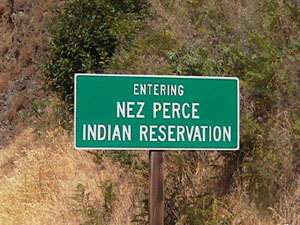 The route also runs through a portion of the Nez Perce Indian Reservation. Many people live across the river from the road in this region. 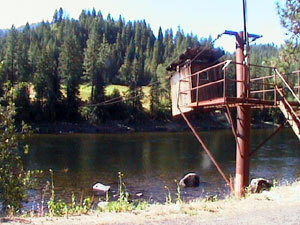 They get to and from their homes in these little cableways that extend across the river and number in the dozens. 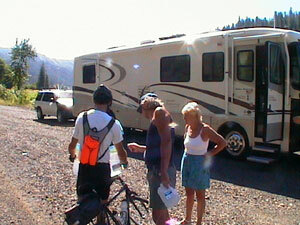 Just after Syringa we met up with some RVers who we met a few times earlier on our trip. 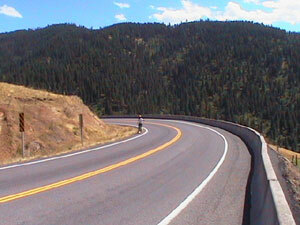 We first saw each other on the top of Pipestone Pass just before Butte, Montana when Joe stopped to ask them for water. They saw us again yesterday and then again today. They decided to stop and talk to us this time since the number of coincidental encounters was uncanny. Here is a picture of Joe showing them the maps we use. It had been a downhill run for the past 96 miles but the fun ended in Kooskia. We rode up the south fork of the Clearwater River to Harpster where the route diverges from the river and heads up over a mountain at a 7% grade for 13 miles to Grangeville. It's still 6% or so to the top of the White Bird Hill - a total elevation gain of 3000 feet over the course of 37 miles. Grangeville is in the Camus Prairie region of Idaho, an area much different from the steep, wooded canyon walls that rose from the Loscha River I rode along yesterday. 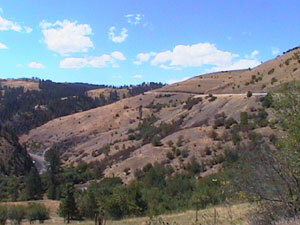 The Camas Prairie hosts thousands of acres of grain and hay fields that are bleachblonde in color. Do you have hot water? Does your television receive more than one channel? We ask these questions because there are a number of motels on the route that do not have one or more of these necessities. Mr. Deeds was a pretty typical Adam Sandler movie. I was not terribly impressed but it was a nice diversion. This is the third movie that I have seen on the trip so far. After the movie we went to a pizza joint for a pie. The waitress asked Joe about his shirt from Tailwind Cyclists in Pittsburg, Kansas. It turns out that she is originally from Topeka, Kansas. We had to ride our bikes all the way to Idaho to meet a good looking girl from Kansas. A guy in Missouri told Joe that "there's a pretty girl behind every tree in Kansas."